I didn't start off liking cars. Growing up in LA, kids like me have to aspire to be different. City kids are raised with the intention of taking over the family farm and I was no different. So I thought I was going to be an Air Force pilot someday. I read books on planes, built model planes, I went to airshows, and even joined Junior ROTC in high school. But that dream was already fading when I found out military pilots had to have 20/20 vision to fly and I knew that was one test I couldn't pass. 1992, I from graduated high school with no direction and interests to speak of. While in college and without much money, my car needed work. My first car was a 1988 4 cyl Mustang, in poor condition, but I didn't know how bad at the time. So in 1993 I joined an adult school auto-shop class, nights at Fairfax High, my old high school. And I quickly found out what a piece of junk it really was. I was reading a few off-road magazines at the time , so naturally I wanted a 4x4. 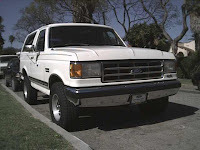 I went to my parents for some money, and they reluctantly bought me a white 1987 Ford Bronco (this was pre-OJ murder spree). Later, I would find that the truck was better suited to hauling car parts then I was at off-roading. In auto class I made some new friends who were heavily in to muscle cars. Besides, 60’s cars were 'the thing' in the early 90’s and still cheap. Now off my 4x4 kick, I bought my second car a 1969 Torino GT sportroof with some savings. I enjoyed working on it more then I liked driving it. It was a fine first project car and I felt like I was participating in the 'culture' with my new friends. Fast-forward to 2001, and as they say, the best things never last, so after 70 some years, the LAUSD and Fairfax High School closed auto-shop, and forced the teacher to retire. I’ll never forget Mr. Peihl, he may have not been the best teacher, but he was a great human. And there went one of the last bastions of teaching kids real world skills. The school quickly transformed the open auto shop into basic classrooms to handle the overflow of kids bused in from all over the city. As it so happens, only a few months before the shop closed, I purchased my third car --a 1968 Mercury Cyclone GT fastback. The lesser-known cousin of my Torino. The car was rough, but complete, with lots of factory options, and super rare! I have yet to actually see another on the street after all this time. With auto-shop closed, I did the entire two-year restor ation in the backyard. People adored the Cyclone --what a looker, it was one sharp! Now living on my own, I kept it in the parking space at my apartment for the short time. I continued to use my parents backyard & driveway to build cars. Yes, I can build a car outside. It's LA it really never gets too cold here. With the Cyclone at my bachelor pad and an open space in the driveway, my family could breath again. Not me! I had the itch. And it wasn’t long before my friend Ray almost literally stumbled over my next project. He found a 75-year-old gentleman that was selling a car he wanted, stored in his garage for 10 years. It was a 1970 GTO convertible (too much $$$). 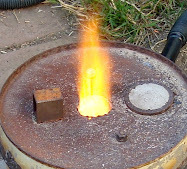 BUT beside that was a 73-year-old pile of parts. Ray called it a Model T, but I knew it was a stock Model A Ford. 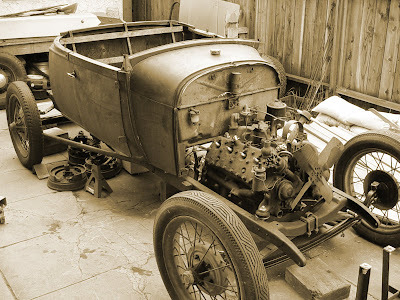 It was a partly disassembled 1929 roadster project in what could only be described as somebody's 'labor or love'. Ray told to the seller, “I believe I have a buyer for the roadster”. So I bought it sight-unseen for $2500. Little did I know what I was getting into? It took another two years to build that heap into a hot rod, and it would never look at cars the same way. My mind was set on hot rodding.